A popular Maine Democrat, George John Mitchell was the majority leader in the U.S. Senate from 1989 to 1994. George John Mitchell was born in Waterville, Maine, on August 20, 1933. He was the fourth of five children (one daughter and four sons) of Mary Saad and George Mitchell. His mother had emigrated as a young girl from Lebanon and was a factory worker in mills in the Waterville area. His father was the orphan son of Irish immigrants and worked as a laborer. Young Mitchell was a student at St. Joseph's grammar school and Waterville High School. A scholarship permitted him to earn a higher education. He graduated from Bowdoin College in 1954 with a degree in history. Shortly thereafter he served in the U.S. Army until 1956 and was an officer in the Counter-Intelligence Corps in Berlin, Germany. Returning from active military duty, he enrolled in the Georgetown University Law Center in Washington, D.C. He attended night school and worked during the day as an insurance claims adjuster. With a law degree, earned in 1960, Mitchell became a trial lawyer in the Antitrust Division of the Justice Department in Washington, D.C. He became a member of the bar associations in Maine and the District of Columbia. In 1962 Mitchell was appointed executive assistant to Senator Edmund S. Muskie of Maine. His association with Muskie was to alter his career and political future. "About everything good I know, I learned from Ed Muskie," he once said. Although Mitchell returned to Portland from Washington, D.C. to work for the private law firm of Jensen, Baird, Gardner and Henry, he remained active in politics. He served as the state chair for the Maine Democratic Party from 1966 to 1968. Mitchell became deputy campaign manager for Muskie's vice presidential race in 1968 and for Muskie's effort to win the presidential nomination in 1972. In the early 1970s, Mitchell went back to his law practice job, also serving as an assistant county attorney for Cumberland County part-time in 1971. Mitchell balanced his legal workload with volunteer activity in partisan politics. He was active in the Maine Democratic Party, serving as state chairperson from 1966 to 1968. During the following nine years he served on the Democratic National Committee. The first attempt to win an elected office for himself was a failure. Mitchell was the Democratic nominee for governor of Maine in 1974. He lost the election to an Independent in a three-candidate race. With Muskie's backing Mitchell was appointed the U.S. attorney for Maine by President Jimmy Carter in 1977. In 1979, again with Muskie's backing, he was appointed U.S. district court judge in northern Maine. Although the judgeship was a lifetime position, he held it for only a short while. In 1980 Mitchell accepted an appointment to the U.S. Senate to complete the unexpired term of Muskie (resigned to become secretary of state), who had recommended him to fill the vacancy. This was the start of Mitchell's 14-year career in the United States Senate. Mitchell faced Maine's voters in 1982, seeking election to a full Senate term. He won office with 61 percent of the vote, having made extensive use of television advertisements and travel throughout the state. Mitchell was selected to chair the Democratic Senatorial Campaign Committee, responsible for getting the party's candidates elected in 1984. He was spectacularly effective. The Democrats recaptured control after a six-year period of being the minority party in the Senate. As a reward, the Democrats gave Mitchell the honorary title of deputy Senate president pro tempore. In the Senate Mitchell served on the Veterans Affairs Committee and was interested in health care issues. He served on the Environment and Public Works Committee and was active in seeking legislation on clean air issues related to acid rain and toxic cleanups. As a member of the Finance Committee, he worked on welfare reform and the 1986 tax reform act. His other legislative interests included foster care and child care, trade relations, fisheries, indoor air pollutants, endangered species, and preservation of historic lighthouses. Mitchell attracted attention as a member of the U.S. Senate Select Committee on Secret Military Assistance to Iran and the Nicaraguan Opposition (popularly known as the Iran-Contra Committee). This special congressional panel investigated a covert arms-for-hostages deal with Iran and financial support for Nicaraguan rebels during the Ronald Reagan presidency. The senator proved to be a skilled questioner, with a knowledge of facts and a belief that the acts of some White House staff members were wrong. His performance during the 1987 televised committee hearings and his subsequent broadcast response to President Reagan's addresses brought him favorable notice from the American public and other congressional members. In one of the most memorable moments of the Iran-Contra Affair, Mitchell warned Oliver North to "please remember, that it is possible for an American to disagree with you on aid to the Contras and still love God, and still love his country, just as much as you do. Although He is regularly asked to do so, God does not take sides in American politics." In November 1988 Mitchell was elected to his second full term as senator. He won with an overwhelming 81 percent of the votes cast. It was the highest percentage ever received by a candidate in a state-wide election in Maine history. The high point of his legislative career came when the Democrats elected Mitchell as Senate majority leader. He took the post at the start of the 101st Congress in 1989. As majority leader, he managed the administration and legislative process of the Senate and tended to the proceedings and legislative schedule on the Senate floor. Mitchell quickly developed a reputation as an accommodating, consensus-oriented, and consultative leader. He also was thought of as an effective spokesperson for the Democrats. However, even with a majority in the Senate, the Democrats were unable to overturn any of President Bush's first 23 vetoes. Late in 1991, Mitchell and Oregon Republican Mark Hatfield took on the task of instating a 12-month moratorium on nuclear testing in the Nevada desert. The Senate was able to win the support of 53 cosponsors, a Senate majority. Still butting heads with the opposition, the Senate continued negotiations which lead to a final deal: the moratorium was shortened to nine months and the Energy Department would have to end all testing by September 1996. Until that date, the administration would be permitted to conduct up to 15 tests, primarily for safety reasons, the Bulletin of the Atomic Scientists reported in 1992. In March 1994, Mitchell announced his retirement from the Senate at the end of his term. Within a month of Mitchell's announcement, Supreme Court Justice Harry A. Blackmun announced his retreat as well. Mitchell, who was a federal judge before taking over for Edmund Muskie in the Senate, was named as one of President Bill Clinton's choices as replacement. Clinton could have easily kept the position that of a liberal judge by replacing Blackmun with Mitchell. Mitchell turned down the offer, however, citing several reasons, saying he'd like to "live a little," Newsweek reported, and not spend so much time at work. He also said he felt it would not be proper to have been Senate majority leader over the same senators who would be voting on his confirmation to the Supreme Court. Speculation also abounded that Mitchell, a serious baseball fan, was holding out for the job of baseball commissioner, where he would earn approximately $1 million a year while watching games all over the country. Vanity Fair also noted that it was around this time that he became seriously involved with Heather MacLachlan, whom he would marry. In a June 1994 issue of Fortune, Daniel Seligman and Patty de Llosa noted that Mitchell's retirement was financially timely: it came three years after the Senate pay raise of 1991, resulting in a salary boost from $113,400 a year to $148,400 at the time of his retirement; the congressional pension plan, which he would most likely receive, would include annual payments of two-and-a-half percent of the average of the three highest years' pay for each year served with the legislature. He would presumably collect an annual pension of $84,595, and, Seligman and de Llosa calculated, based on the life expectancy of a white male his age and a four percent inflation rate over those years, he would stand to collect $2,895,248. Before his retirement, however, Mitchell continued to work on massive health care reform proposals. His intention was to help Americans without insurance and provide security for those who do so. Mitchell's 1400-page bill called for, among other things, a new subsidy plan to help people buy insurance, including a government voucher system to cover wholly the cost of health care for pregnant women and children under 19 if they met certain low-income requirements. He wanted "community rating zones" to prevent insurers from canceling coverage and require insurance companies to cover those with pre-existing medical conditions. The problems Mitchell encountered with his proposal was the role of government: how could it increase benefits but cut costs? Mitchell had hoped for historic reform with his bill, but was lucky to get a humble bill out of his ordeal. 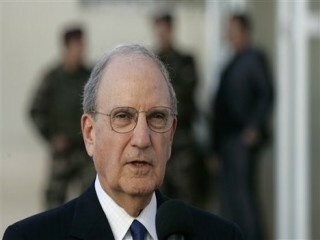 Even after his retirement, George Mitchell maintained a high political profile. In 1995, he became special counsel to the firm of Verner, Liipfert, Bernhard, McPherson and Hand in Washington, D.C. That same year, Clinton named him to head a committee negotiating the reinstatement of the cease-fire in Northern Ireland. Mitchell's commission wrote a report, the Economist reported, that was "scrupulously balanced and meticulously written," recommending that the Irish Republican Army and British unionists begin talks and dispose of terrorist weapons simultaneously. It was rejected by then-Prime Minister John Major, who wanted weapons disposed before negotiations even began, complicating Mitchell's attempts at a breakthrough. Mitchell's impressive report was all for naught, regardless of Major's disapproval, when the IRA blew London docklands apart, killing two people and injuring over 100 during a Friday rush hour. Apparently, the IRA began planning its attack on the day Mitchell presented his commission report. Later that year, Mitchell was elected to the board of directors of the Xerox Corporation. Besides his seats on boards of Federal Express, UNUM, and Walt Disney, his duties at Xerox involved serving on the finance and nominating committee. The White House looked for Mitchell's help again in 1996, to prepare President Clinton in his upcoming presidential debates with Bob Dole. Newsweek noted that Clinton aides said Mitchell was skilled at mimicking Dole's senatorial style after observing him for 15 years. After Clinton's re-election and Secretary of State Warren Christopher's resignation, Clinton considered Mitchell to take over, at Christopher's recommendation, although he chose Madeleine Albright instead. Mitchell was divorced from his wife, the former Sally L. Heath, after almost 30 years of marriage and one daughter, Andrea. He wed Heather MacLachlan on December 10, 1994, a former agent for tennis pros. View the full website biography of George John Mitchell.